Dr. Katrina H. Avery’s commitment to advancing the field of medicine is rooted in a deep personal desire to care for others. And that commitment is matched by her passion for service to others. Demonstrated by her many educational pursuits and accomplishments, professional accolades and involvement in medical societies and community boards, Avery has impacted the field of medicine in a very personal way. 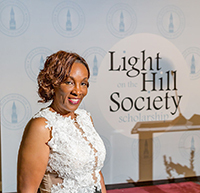 Her tireless work as a servant leader giving back to her community has been done while at the same time forging a remarkable professional career and being devoted to her family. She believes in being an excellent physician who sincerely cares about patients and their families as well as her fellow physicians, nurses and staff. Avery also believes in paying it forward and continues to mentor and encourage those who aspire to become physicians or pursue other health-related careers. She is the division chief at Harris & Smith OB-GYN, where she specializes in obstetrics and gynecology and for more than 20 years has been taking care of women in the Durham community. Avery received her bachelor of science degree in biology and chemistry from the University of North Carolina in 1982. She attended North Carolina Central University, where she received her master’s of science degree in biology. She received her medical degree, and completed graduate studies in maternal and child health at Carolina. She completed her residency in obstetrics and gynecology at the Medical College of Georgia and is board certified with the American Board of Obstetrics and Gynecology. Professionally, Avery wears many hats, not only at Harris & Smith OB-GYN, but also with numerous boards and committees, including the OB-GYN Residency Directory at Duke Regional Hospital, and as OB-GYN department chair at Duke Regional Hospital. Avery has held leadership positions on several boards and committees at the UNC School of Medicine, including secretary, treasurer, vice president and currently president of the Medical Alumni Association and currently president of the UNC School of Medicine Medical Alumni Association, the first African-American to serve in this role. In an effort to create transformative change, Avery models excellence as practitioner of medicine with a compassionate spirit and as an instructor and mentor to aspiring physicians. The compassion and commitment to her patients is also recognized by her peers throughout the Duke University Healthcare System. She has served the Duke Regional Board of Trustees on various committees including the Credentialing and Nominating committees. She served three terms as a member of the School of Medicine Medical Alumni Council, two terms as a member of the Medical Foundation of North Carolina’s board of directors and was a member of the UNC School of Medicine National Loyalty Fund committee. To honor their parents, Avery and her husband established the Howard-Avery Loyalty Fund Scholarship for medical students. She is an active member of Delta Sigma Theta Sorority, Inc. and the Triangle Park Chapter of the Links, Inc.
Avery is intentional in being an effective voice and advocate for recruiting and retaining African-American medical students, faculty and staff in the UNC School of Medicine. She is passionate about supporting her alma mater, including the Global FedEx Center, the Sonya Haynes Stone Center for Black Culture and History, the Morehead-Cain Foundation, the UNC School of Medicine and the MED Program. Avery is fundraising for Carolina’s National Panhellenic Garden, the Light on the Hill Society Scholarship and many other Carolina campaigns. “Helping others is why I do what I do,” Avery said. “The professional legacy set forth by my UNC experiences involves the mentoring of students at the undergraduate and professional levels. It is my obligation to give them the benefit of my knowledge and education and to pay forward the many blessings I have received.